To sign up for Podcasting 101 and/or Podcasting 102, please click here and for more info, email Gina at ginahyams@gmail.com. In Podcasting 101, Susan Davis will introduce participants to the building blocks of a great podcast, including true listening, the art of hosting, perfecting a sound, achieving a tone, and designing an efficient production structure and schedule. She will also address tech issues (all you need to get started is an iPhone and a computer) and share tips on how to build an audience through promotion and distribution. 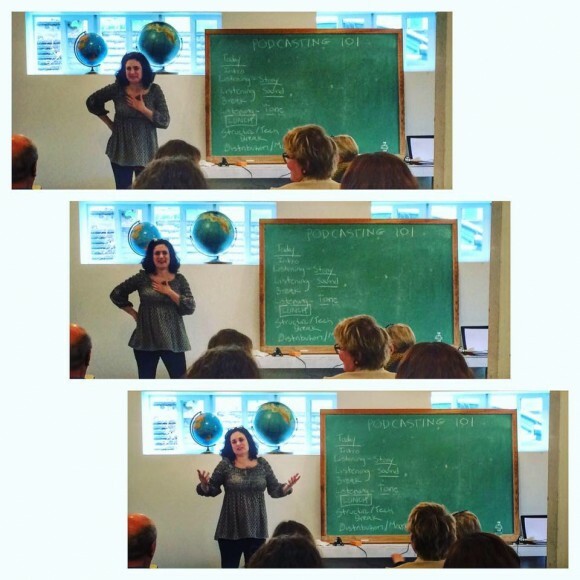 The workshop is appropriate for both aspiring podcasters and podcast-loving audiophiles. Pre-requisite: Podcasting 101 with NPR Producer Susan Davis and/or you are a current podcaster. In Podcasting 102, participants will workshop their individual show’s description and mission (a.k.a. the all important “elevator pitch”). Susan will help each student find their show’s best structure (“bento box” or “mother-in-law’s window boxes/beer flight”) and plan a detailed, sustainable production schedule. She will also answer tech questions, review publishing options, and brainstorm marketing and distribution techniques. You will leave this workshop able to start work on your podcast the very next day! Susan Davis is a storyteller—by nature, by craft, by art, and by profession. For two decades, she has ferreted out the most memorable, most profound, most complex, and most interesting characters and brought their tales to the listeners of Public Radio. She has worked as a producer for Marketplace, Soundprint, All Things Considered, and Talk of the Nation at NPR, as well as for The State of Things on North Carolina Public Radio/WUNC. Her recent podcast clients include NPR’s Alt Latino, The Good Fight with Ben Wikler (#1 on iTunes), Press Record (from the Southern Oral History Project at UNC Chapel Hill), The Monti Radio Hour, and Classical Classroom. 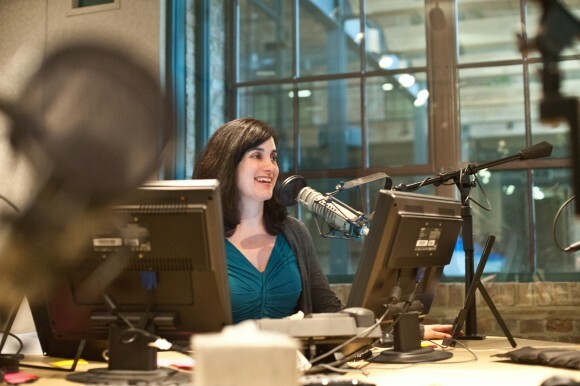 She has taught podcasting/audio production at a wide range of venues, ranging from Duke University to the Public Radio Program Directors Conference to the Cultural Affairs Department of the United States Department of State. If a workshop must be canceled due to low enrollment or unforeseen circumstances, Muddy Puppy Media will refund all tuition in full. If a student chooses to cancel—for any reason—at least four weeks prior to the first day of the workshop, Muddy Puppy Media will refund the tuition minus a US$30 administration fee. If a student cancels between six and 28 days prior to the start of the workshop, they will receive a 50% refund. There are no refunds for cancelations made five or less days before the workshop. UPDATE: We are postponing this workshop. If you are interested in future San Miguel de Allende podcasting workshops, please email Gina at ginahyams@gmail.com to be alerted when we reschedule. Podcasts are surging in popularity thanks to smash hits like “Serial” and how simple and inexpensive they can be to produce—all you need to get started is an idea, an iPhone, and a computer. There are hundreds of thousands of podcasts available now about every topic under the sun. The ones that break through and connect with audiences share one thing in common: compelling stories. Susan Davis is a storyteller—by nature, by craft, by art, and by profession. For two decades, she has ferreted out the most memorable, most profound, most complex, and most interesting characters and brought their tales to the listeners of Public Radio. In Podcast Storytelling 101 Intensive, she will teach students how to create vivid, narrative-driven podcasts. Powerful stories bring ideas to life, allowing listeners to do things like hear a painting, smell an architectural wonder, see a war zone, taste a taco, and feel a breeze. Susan will detail the essential elements of audio stories and introduce the building blocks of a great podcast, including true listening, the art of hosting, perfecting a sound, achieving a tone, and designing an efficient production structure and schedule. She will also address tech issues and share tips on how to build an audience through promotion and distribution. Workshop participants will hone their vision and develop plans for their personal podcasts. They will also gain hands-on recording, editing, and mixing production experience. Working in teams, the group will capture San Miguel de Allende’s soundtrack of mariachi bands, church bells, fireworks, and barking dogs and create podcasts that explore the multi-faceted expatriate community there. Susan Davis has worked as a producer for Marketplace, Soundprint, All Things Considered, and Talk of the Nation at NPR, as well as for The State of Things on North Carolina Public Radio/WUNC. Her recent podcast clients include NPR’s Alt Latino, The Good Fight with Ben Wikler (#1 on iTunes), Press Record (from the Southern Oral History Project at UNC Chapel Hill), The Monti Radio Hour, and Classical Classroom. She has taught podcasting/audio production at a wide range of venues, ranging from Duke University to the Public Radio Program Directors Conference to the Cultural Affairs Department of the United States Department of State. 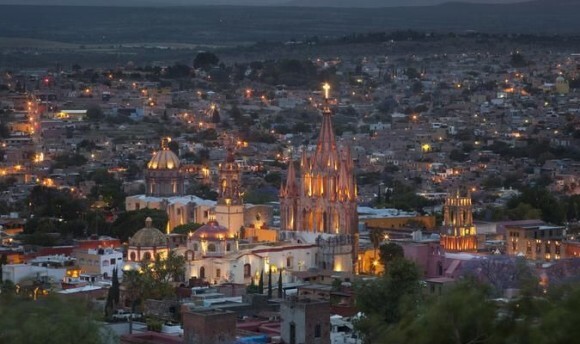 San Miguel de Allende, a UNESCO World Heritage Site, is located in Mexico’s central highlands. It is known for its Spanish Colonial architecture, thriving arts and food scenes, and lively expatriate community. 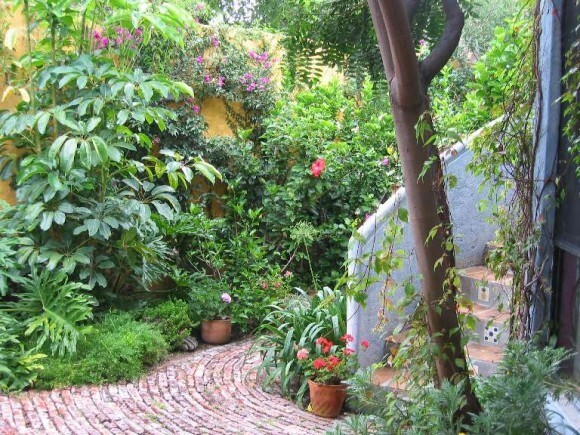 The workshop will be held at Casa Duende, a private home in San Miguel’s mural-filled Colonia Guadalupe neighborhood. San Miguel weather in August is mild, typically with a high of around 80 °F and low of about 60 °F. It rains intermittently, rendering the high desert landscape green and lush with flowers. The workshop will kick off with a welcome dinner on Sunday and then convene at 10:00am each day during the week. Mornings will be filled with lectures, tech demonstrations, and discussions; lunchtime will be when we brainstorm about personal podcast projects; and afternoons will be spent out and about exploring San Miguel, doing field recordings, and collaborating in small groups. We recommend that you arrive at least a day or two early to adjust to the high elevation (6,300 feet) and stay as long as you can after the workshop, as you won’t be ready to leave Mexico. US$749 early bird discount through June 30 / US$799 after July 1. Enrollment is limited to 12 participants. The workshop fee includes a welcome dinner, five lunches, excellent snacks, and a farewell tequila toast. Accommodations are not included in the price of the workshop. Lodging suggestions near the workshop venue will be provided to you via email after you register for the class. Laptop, smart phone, USB cable, and headphones (not ear buds). For more information and to register, please email Gina at ginahyams@gmail.com. If the workshop must be canceled due to low enrollment or unforeseen circumstances, all tuition will be refunded in full. If a student chooses to cancel, for any reason, at least four weeks prior to the first day of the workshop, Muddy Puppy Media will refund the tuition minus a US$100 administration fee. If a student cancels between six and 28 days prior to the start of the workshop, they will receive a 50% refund. There are no refunds for cancelations made five or less days before the workshop. Muddy Puppy Media presents Podcasting 101 workshops with acclaimed NPR producer Susan Davis from 10:00am to 4:00pm on Saturday, April 30 at the Lichtenstein Center for the Arts (28 Renne Avenue in Pittsfield, MA) and on Sunday, May 1 at Time & Space Limited (434 Columbia Street in Hudson, NY). The workshop will be of interest to both aspiring podcasters and podcast-loving audiophiles. In Podcasting 101, Davis will introduce participants to the building blocks of a great podcast, including true listening, the art of hosting, perfecting a sound, achieving a tone, and designing an efficient production structure and schedule She will also address tech issues (all you need to get started is an iPhone and a computer) and share tips on how to build an audience through promotion and distribution. Tuition is $150 early bird special through March 31 /$175 after April 1. Limited financial aid is available. To reserve your spot, please email Gina (noting your interest in the Pittsfield or Hudson workshop) at ginahyams@gmail.com. Please note: Susan will also teach a Podcast Storytelling 101 Intensive July 31 – August 5 in San Miguel de Allende, Mexico. For details, please click here. It’s heartening to see my mother’s legacy live on in her students and friends. 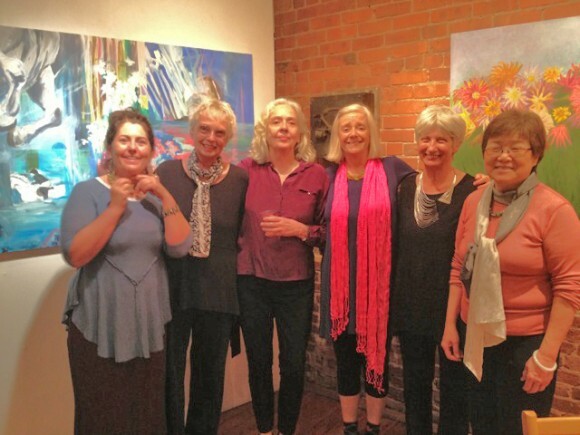 A group of them, who met more than 20 years ago at her art classes in San Francisco, recently opened an exhibition at Canessa Park Gallery. It’s up through January 30. Hours are noon to 3:00pm on Wednesdays or by appointment by calling 415-885-5695. Their touching and inspiring group artistic statement follows below. The six artists in this show met by chance more than two decades ago, when each of us signed up for a class led by Leigh Hyams. Those first classes were in the former University of California Berkeley Extension campus in San Francisco, a couple of rambling old Spanish-style buildings in the Western Addition. Some of us began in a drawing class, others in painting or mixed media. We worked side by side in crowded rooms, on paper or canvas taped to the walls or on drawing boards on tables or mounted on easels. Leigh encouraged us to paint big and with abandon, and to stand while painting so we could use our whole body. And she encouraged us to live life adventurously, and we did, joining her painting workshops at Esalen and in Greece and Brazil and Mexico and France when we could. After a few years of studio classes, we felt ready to work on our own, and Leigh encouraged us to carve out space for our art at home or to rent our own studios. But because we still wanted her inspiration and guidance, we formed a critique group that met with her once a month, to help us keep making art and to keep growing as artists. During this time, we also worked with Leigh and other students of hers on her film Making Marks. 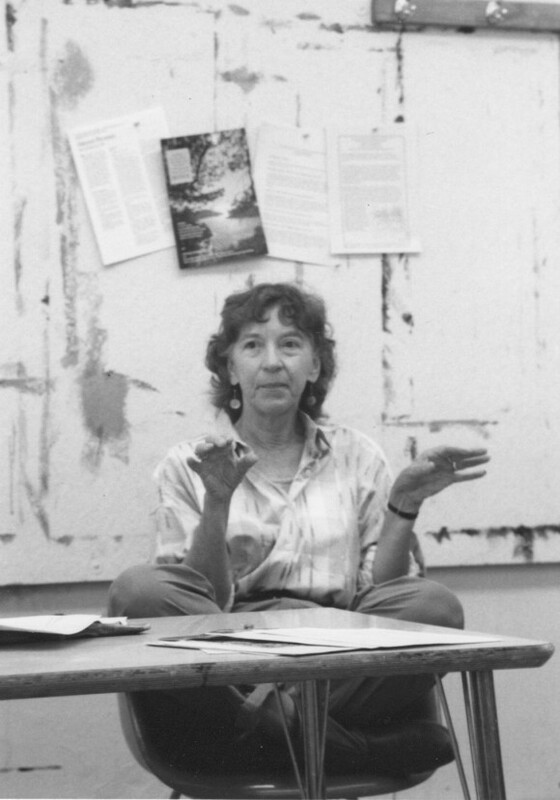 When Leigh moved to Mexico in 2001, we continued to meet without her, for we found that we had absorbed her ideas about painting and her teaching about visual language so well that we could critique one another’s work in her absence. She went on to build a live-in studio in San Miguel de Allende and to paint prolifically for the next decade, with solo shows in San Miguel and Querétero. 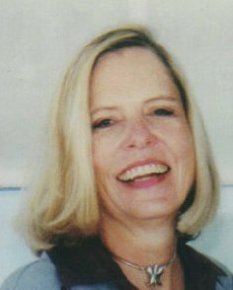 Whenever Leigh visited San Francisco during those years, she arranged to meet with us when possible, and many of her large following of students visited her in Mexico. Her last expansive series of paintings was of giant flowers in her elegant and buoyant gestural style, reveling in color as always. She died in 2013, and at her memorial in San Francisco, her daughter, Gina, gave Leigh’s paintbrushes away to her former students and friends. Over the years, our group has continued to follow Leigh’s urging to take chances and to experiment with styles, subjects, and mediums. Styles have ranged from abstract to figurative, and subjects from childhood photographs to landscapes, seascapes, and skyscapes, rabbits and fairytales and death boats, glaciers and rocks, real and imagined dramas, self-portraits and dog portraits, horse portraits and night scenes. Painting and drawing mediums have included acrylic paint and watercolor, encaustic, and wood-burning tools. Some members of the group have ventured into sculpture, in mediums that include fabrics, trash from the city dump, garage-sale finds, broken plastic dinnerware, ruined umbrellas, hunks of marble, leather, and cement. We try, like our teacher, to make work that is surprising and alive. We sell our work, though we remain amateurs, in the best sense of the word. For we believe that art is important, not just to each of us individually and as a group, but to the culture in general and to the random universe. Like our teacher, we believe that art allows us to live more fully, that creativity is the lifeblood of being human, and that every piece of art we create is a kind of miracle: a new thing in the world made by our own hands, and often one we had no idea we were capable of making. 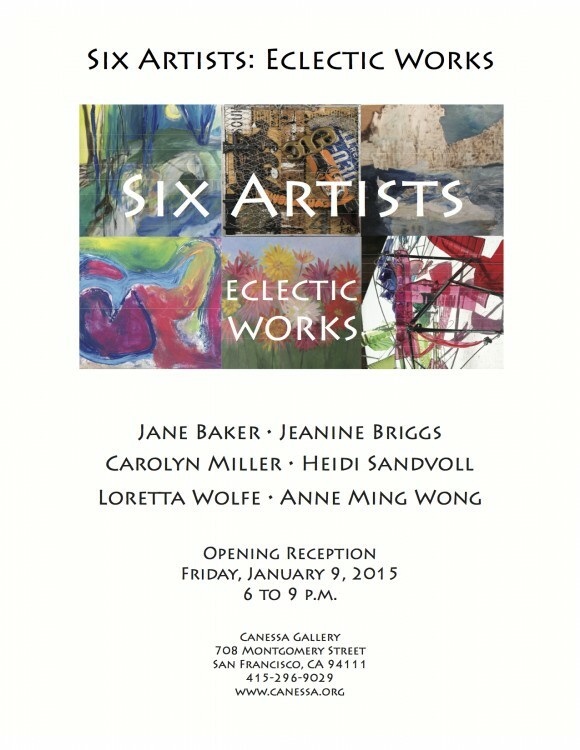 Artists at the opening (left to right): Heidi Sandvoll, Loretta Wolfe, Carolyn Miller, Jane Baker, Jeanine Briggs, Anne Ming Wong. Focus elsewhere. Spring. The Dog. 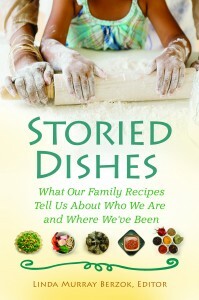 Linda Murray Berzok is a widely published food scholar who edited the new anthology, Storied Dishes: What Our Family Recipes Tell Us About Who We Are and Where We’ve Been (Praeger, 2010). The 50 personal essays document how women universally use inherited family recipes to remember and memorialize key women in their lives and to aid and measure their own growth and development. Included are reminiscences of an Egyptian aunt, a poor mother from Australia, a Katrina-flooded New Orleans family, Turkish relations, Chinese mothers, and Indian grandmothers. Linda has a Master’s Degree in Food Studies from New York University, where she has also taught food writing. For her previous book, American Indian Food, she was awarded a Linda D. Russo Travel Grant. She and her husband, Robert, divide their time between Tucson, Arizona and Stephentown, New York. Gina: Please describe the legacy of your mother’s recipe collection and how it inspired you to create this book. Linda: My mother left behind 12 boxes crammed with at least 300 index cards, yellowing and tattered, when she died in 1996. It was not until two years later that I sat down and went through them to use these rich primary sources as the basis for a paper in my Food and Culture course at NYU. I read every card; I laughed and cried. My mother had used her collection as a kind of diary, noting what she served at every holiday and special occasion, and dating special menus like my father’s retirement party, my brother’s return from the Navy, my home wedding reception. She noted our preferences and totaled and itemized the cookies she made each Christmas. She was the daughter of Swedish immigrants, and she was born in Minnesota. 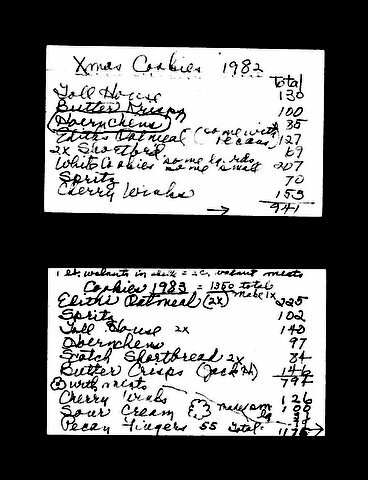 I wrote a lengthy paper tracing her culinary life–at least 40 years of it–through the cards. 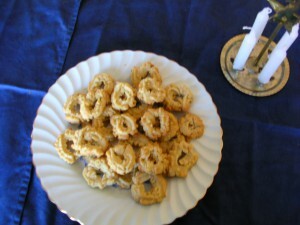 Although she included some Swedish heritage dishes, she retired many of these as she set about creating her own American identity. This is common among first generation American women. 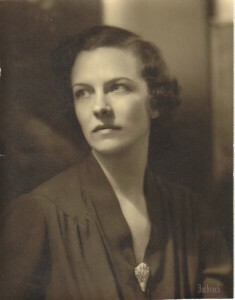 She lived through the Depression (Tomato Soup Cake) and World War II (rationing did not stop her from baking) and finally emerged as a mother and home cook in the 1950s with cooking characteristic of that culture–Jell-O molds, Spanish Rice, Tuna Casserole, Frankfurters and Noodles. Her one adventurous departure was a class she took in Chinese cooking during the initial heyday of ethnic cooking in the ’70s. She even recorded having served homemade eggrolls and Chinese “crackers” one year at Thanksgiving, the most iconic American meal! When I talked about my mother’s collection to Elderhostel groups, it was clear it struck a real chord. The women were eager to share their own stories, which after all, are what make family recipes so compelling and memorable. So I decided to collect tales from as many different cultures as possible, and package them in Storied Dishes and explore what they have to tell us about women, food, and culture. Gina: Your anthology represents such a range of voices and experiences. How did you find the contributors and what sort of editorial guidance did you give them? I put out a Call for Submissions first on the listserv of the Association for the Study of Food and Society, which is a primarily academic list, and turned up many colleagues who agreed to contribute. Sometimes people passed my request along to women they thought would be interested. I ran an ad in The Women’s Times newspaper produced in Great Barrington, Mass., a notice in the e-newsletter of the former women’s writing collective Inkberry in North Adams, Mass. and the e-newsletter of the Culinary Historians of New York. I also asked lots of friends, some of whom had already shared their stories with me. I asked for short pieces, between 1100 and 1200 words, telling the story behind one favorite family recipe. I stressed that stories had to have some drama, an edge. Conflict was a plus. No narratives of going to Grandma’s house for her wonderful chocolate chip cookies every Sunday unless the script went beyond to reveal something unexpected. Good solid literary writing was essential. I worked back and forth electronically with contributors, often having to trim pieces. The process took a number of years. Gina: What exactly does one study when earning a masters degree in food studies? Anthropology? Sociology? I was extremely fortunate to be in the NYU Food Studies program early on. The course of study included two levels of Food Science, Food Policy, Food and Culture, Food History, Research Methods, Food Marketing and Accounting, certification in food handling and safety, Recipe Development and Analysis. Some courses required hands-on food preparation in the wonderful kitchen. Since I had already written a book on nutrition, done public relations for Campbell’s and other food accounts, and served as chair for the Fairfield, Conn./Westchester Co. New York’s “Taste of the Nation” event (part of the national Share Our Strength, I was exempt from some of the pre-requisites. And since I had a solid writing background in popular national magazines and trade publications, I was offered the opportunity to teach the required course in Food and Nutrition Writing while I was matriculating my Master’s. The paper on my mother’s recipe collection was accepted for publication while I was still in school in a book on American women and ethnic food, and it is used as a reading in the program today. I completed an independent study project on archaeological methods used to determine what people ate in prehistoric times by volunteering for the Noen U-Loke dig in northeast Thailand. The site was one of the outlying villages that supplied rice to the great capital of Angkor in Cambodia. We were digging in a cemetery so we were turning up skeletons left and right! Ironically, the site turned out to be the only place in the world where some people have been found buried in food, specifically between layers of charred rice. So one could infer that there was a surplus of rice production that allowed some of the elites (as determined by other grave goods) to be buried in the most precious commodity in this society–rice. A big plus of the NYU program was the wide cultural diversity of the students. No matter what we were discussing, there was someone from that ethnic background who had first-hand knowledge. Gina: What is Sabores sin Fronteras? Linda: Sabores sin Fronteras, which means Flavors without Borders, is a bi-national alliance based on Tucson that documents, preserves, and celebrates the foodways of the Southwest and northern Mexico which at one point in time were not divided by a border. Sabores was set up by ethnobotanist Gary Nabhan, a Research Social Scientist at University of Arizona, and Maribel Alvarez, folklorist at the Southwest Center at University of Arizona, along with about 50 founding members. This year, we held a symposium on wheat in Sonora, Mexico and grasslands cattle raising on both sides of the border. We are currently working on an anthology to be published by University of Arizona Press. Gina: I know that you’re an avid traveler. When you visit a new destination, how do you approach the culinary landscape? What sort of questions do you ask to understand what food means about a culture? Linda: I always read about the food before going, so I’ll know what to order and have some basic understanding of the culture. For Greece and Sicily, I bought cookbooks that were heavy on description of the environment and culture. For Laos, I got some great primary source material compiled by Alan Davidson (Traditional Recipes of Laos) given to him by the royal family’s chef Phia Sing. I also collect articles on the food, sometimes for years before going somewhere so I know which restaurants I want to try. For Luang Prabang, the original capital of Laos, I read a wonderful article by Amanda Hesser from The New York Times, recommending 3 Nagas as one of the best restaurants not only in Laos but in all of Southeast Asia! I knew to order an appetizer she had of dried River Weeds with Water Buffalo Skin, coated with sesame seeds. It was wonderful and I never would have known about it otherwise. Once in the country, I like to visit markets to see what ordinary folks are eating and to sample. So many of cultures cook things outside–street food and sometimes this is the best, most interesting food. Also, markets and some stores carry local utensils and dishes, allowing me to purchase rice baskets and a coconut shell spoon for serving rice in Cambodia and some wonderful Celadon spoons, satay dishes, and dipping bowls at an outlet in Bangkok. Waiting for Superman presented the problem with public schools in the U.S. The students, faculty, and administration at Monument Mountain Regional High School in Great Barrington, Mass. are forging a solution with The Independent Project. The kids made this short film to inspire other schools to consider this model of education. Please spread the word (and, yes, that’s my girl in the radio studio). March 16, 2011 update: Here is a link to an op-ed about the Independent Project that Susan Engel published in the New York Times yesterday. Yesterday a postcard arrived from Monument Mountain Regional High School’s Project Sprout. On one side were photos of the kids working in the garden and constructing the farm stand and on the other, the following elegant thank you note. I had nothing to do with any of it beyond being a “garden mom” schlepping Annalena to and fro. Makes me a little weepy to see the summation of all they’ve accomplished this year. These teens are so hardworking and smart. There is hope. The holidays are a chance to reflect on the year. For us this means remembering all of the classes we taught in the garden, from pre-K through 12th grade, and working with a special needs group on a weekly basis throughout the summer in the garden. 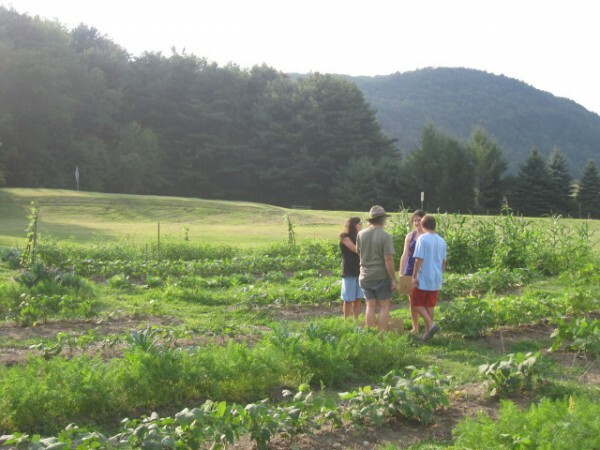 It also means remembering donating 200 lbs of organic produce a week to people in need around the Berkshires, and working with our food service program to serve our food in the three cafeterias of our district three to four times a week. It means laughing about how nervous we were the first time we presented at another school, and smiling about how many other schools we have inspired since then. But mostly, it means remembering working together, with students, teachers, and community members, to cultivate our 12,000 square foot vegetable garden and heirloom fruit orchard. The holidays are also about thinking of all the people who lent us a helping hand throughout the year. We know that without your tremendous support, none of what we just mentioned would have been possible. Thank you, and have a great holiday. 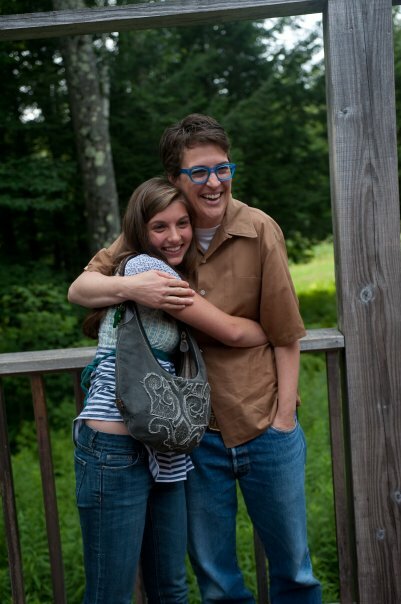 Rachel Maddow and Suzanne Carbonneau. Photos: Christopher Duggan. I know nothing about dance. I am a fan. 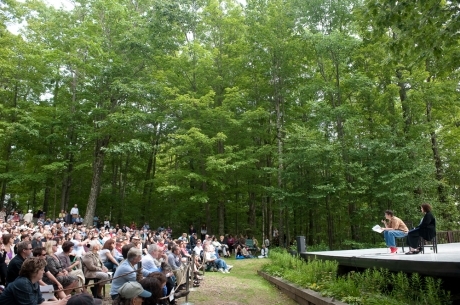 I am a fan of dance and of Jacob’s Pillow and a fan of people who know nothing about dance going to see dance. Sometimes we choose to serve our country in uniform, in war. Sometimes in elected office. And those are the ways of serving our country that I think we are trained to easily call heroic. It’s also a service to your country, I think, to teach poetry in the prisons, to be an incredibly dedicated student of dance, to fight for funding music and arts education in the schools. I think there’s a great speech to be made, I think there are bumper stickers to be written, I think there’s a little patriotic chest-pounding that can be done, about what value arts are to a country. Not in terms of their propaganda, but in terms of the arts as a sign of national greatness, that a great country nurtures great artists. And that the greatness of a country is measured in part by its freedom, and artistic freedom is one of the measures by which a country shows its greatness. David Samuels is the author of The Runner: A True Account of the Amazing Lies and Fantastical Adventures of the Ivy League Impostor James Hogue. He is a contributing editor at Harper’s Magazine and a frequent contributor to The New Yorker, where sections of The Runner first appeared. A graduate of Harvard and Princeton, he lives in Brooklyn with his wife and young son. The Runner tells the story of a drifter and petty thief named James Hogue who woke up one cold winter morning in a storage shed in Utah and decided to start his life anew. Reimagining himself as a self-educated ranch hand named Alexi Indris-Santana who read Plato under the stars and could run a mile in under four minutes, Hogue applied and was accepted to Princeton University, where he got straight A’s, made the Princeton track team, dated a millionaire’s daughter, and was accepted into the elite Ivy Club before his deception was finally exposed. Gina: The vagaries of higher education are on my mind a lot these days, as my daughter starts high school in the fall. I went to San Francisco State University. Through the course of my publishing career, I’ve known a lot of Ivy graduates and seen up close how that club functions…they do rule the world and favor their own and they’re not all as brilliant as they think they are. I’m encouraging my daughter to aim high with her college ambitions even though we have little savings to pay for tuition and no legacy ties because I don’t want her to be penalized for lack of access to power. Who mentored you as a writer? David: I learned how to write comedy as an editor of The Harvard Lampoon and found that the lessons I learned over time were applicable to writing fiction and narrative nonfiction. I am grateful to a number of very generous editors who gave me a chance to write good stuff when I was sleeping on my friends’ couches in New York, particularly Lewis Lapham at Harper’s Magazine and Anne Fadiman, the former editor of The American Scholar. I think I have learned the most about writing over the years from my friend Ben Metcalf, a fellow Lampoon editor who later became my editor at Harper’s. Gina: You seem to identify with James Hogue because you too were an outsider when you applied to Harvard. Where are you from and what was it about you at 18 that made you a winning candidate for admission? David: I was born in Brooklyn and went to an orthodox Jewish day school in New York City. My grades in high school were quite uneven. I have no real clue as to why Harvard chose to admit me. I can only guess that my combination of indifferent grades, high test scores, and strong teacher recommendations appealed to someone who got bored of admitting kids from Jewish day schools with perfect grades, high test scores, and strong teacher recommendations. Gina: You say that you think the Ivy League should be abolished. What do you propose replace it? David: Nothing. If the Ivy League didn’t exist I think that students and employers alike would be more alive to the range and specificity of particular educational and life experiences rather than simply looking for silly designer labels that promote a fraudulent pseudo-meritocracy that celebrates itself in a frequently nauseating, self-congratulatory fashion while bestowing a parcel of unfair and unearned advantages on their handpicked classes of entitled little snots. That said, I had a wonderful time at Harvard, and wouldn’t be upset if my son was lucky enough to be admitted there. While the classroom education isn’t that great, it is hard to beat the self-confidence that comes from being told at the age of 22 that you have been formally certified as a member of the American elite and can venture forth in the world and tell the suckers how to think and behave. Gina: You are extremely critical of the practice of preferential admissions treatment of children of alumni, yet your son may well benefit from your status. What are your hopes for his education? David: I hope he learns to read and write, and that he can connect in a deep and sustaining way with a particular body of knowledge, whether in the humanities or the sciences. Gina: What are you working on now? David: A multicultural Jewish-inflected novel about the coin-operated machine business.